Take your family or friends on a unforgettable adventure in a luxury Houseboat. 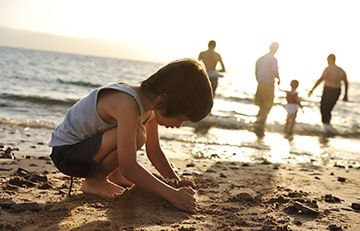 Savour the beauty of Lake Macquarie and have fun till the sun goes down. 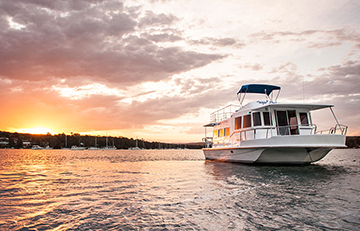 Enjoy Lake Macquarie with it's secluded bays, sandy inlets and clear blue waters. We're here to make any ocassion unforgettable! 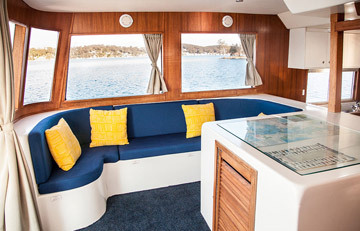 On the weekend of 8-10/3/19 our family had a fabulous time cruising on the huge Lake Macquarie on the beautifully appointed 45' Elite houseboat Sugar Bayb. David and Leanne are the friendliest, most down to earth hosts to deal with and I'm already trying to plan the return visit. We moored overnight in Kilaben Bay to watch a beautiful sunset from the upper deck and at Toronto where the glassy waters shimmered from the street lights. A visit to Belmont baths was lots of fun on Sunday morning as was dodging the yachts racing in their weekly regattas. A fabulous way to unwind and relax in an area the locals could rightfully claim as god's own country. Do yourself a favour and hire one of these boats for a weekend. We had the best time cruising around the beautiful Lake. Caught plenty of fish and cooked up the yummy blue swimmer crabs we caught as well. We had barbecues for breaky and dinner. The fireworks were superb at Wangi and the atmosphere was brilliant. The 5 of us did not stop laughing and just having a wonderful time.Great holiday on the lake we all would highly recommend your houseboats to anyone as they are the best that we have been on, ever. Another beautiful morning on the lake... What a trip! AWESOME boat. Great weather, heaps of fish and crabs, we'll be back. Thanks heaps. Thank you for all your assistance and for providing us such a great boat, allowing us to enjoy prime viewing of the CHS sailing regatta. What a great boat! To get a big group of friends together on & have a ball enjoying the sites, sounds and scenery of the lake. Cruising through it all, magic weather. 2 massive crabs, 1 x 2.5 foot flathead caught and eaten on board. Had a lovely relaxing 50th birthday celebration. Paul caught 48 fish, 9 different species. Thanks you so much Stu! Cheers!